“Make the lie big, make it simple, keep saying it and eventually they will believe it” -Adolf Hitler. I hate to quote an evil psychopath, but it’s time we all woke up to the fact that mass marketing messages have hijacked our science and nutritional health. Look at the tip sheet above, and even check out the Winners Drink Milk website created for your convenience (and more importantly, for your kids!). And begin to see the influence such medias have on what you think and how you behave. Interestingly, though dairy free milks are also usually fortified with vitamins A, D and calcium, they are dismissed as “non-nutrtitious” by medical experts. Why? The nutritional information creatively packaged as health is largely coming from the meat, dairy and big agricultural industries, sponsored and brought to you by the USDA. We take for granted that our government uses only the most solid studies and proven facts to make dietary recommendations. But who (as in people who work there) is the USDA and how are they deciding which information to use? The function of the United States Department of Agriculture is quite broad. It is tasked with developing and executing food and farm policies; contradictorily it is also in charge of promoting the food and farm industries. Interestly, the government experts who create the food pyramid, which is the nutritional foundation for mainstream medical and educational TRUTH, also work (or have worked) for these private industries. These industry “experts” sponsor the research, form “independent” committees with official sounding acronyms, certify the preferred professionals, and create formal decrees on Health. In short, they define The. Way. It. Is. (Don’t believe me? Good for you. Click here and get it from the horse’s mouth.) It’s classic ‘fox guarding the hen house”. And the more of us that believe what they tell us, the truer that information becomes. (kinda) Mob mentality is a complicated phenomenon, and none of us are immune to it. Case in point: USDA guidelines have declared our school lunches to be healthy and nutritious. But we ALL know they are not. But you can’t fight illogical arguments with common sense, can you? Consider the possibility that Good Health is a cover for Big Profit. The flyer above was handed out in a high school health class in a local school. If I was a kid, I would consider this Truth. If I was a busy mom who didn’t know any better, I’d pick up more chocolate milk at the grocery. 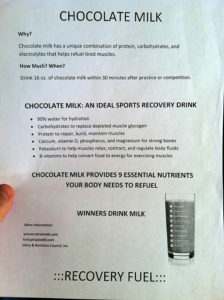 So while milk was once “considered part of a nutritious breakfast”, it is now a recovery fuel designed for WINNERS. The got milk®? and “Milk Mustache®” campaigns are funded by the nation’s fluid milk processors. 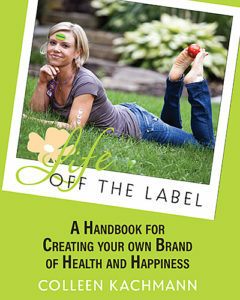 So are the “Drink Well, Live Well®”, “Body By Milk®”, “Liquid Sunshine®” and “Nature’s Wellness Drink®”. The USDA has oversight responsibilities for the dairy and fluid milk programs. Advertising dollars are complicatedly intertwined; but it’s safe to say our tax dollars fund the creation and control of the “education” we see everywhere on the benefits of milk. But there are a lot of well-documented and scientifically valid reasons why milk is not the miracle drink it’s touted to be. Choosing dairy free milk is a healthier alternative for many reasons. Dairy consumption is linked to inflammation and allergies, sinus and ear problems, type 1 diabetes and more. Cows milk is akin to breast milk. We are the only species that suckles (the udders of a cow) from birth till death. But our bodies weren’t made to drink milk after we are weaned! Most of us stop producing (or significantly decrease) the lactase required to digest milk by the time we are five. We are told to keep drinking milk because it is a source of calcium and vitamin D, but there are so many dairy free milk options! Calcium is easily attainable through many sources, including green vegetables like spinach, kale, collard greens and broccoli, beans and legumes, oatmeal, soybeans and so much more. Vitamin D can be harder to find for plant-based eaters; eggs and fatty fish naturally contain the most. I take a supplement to insure adequate reserves. 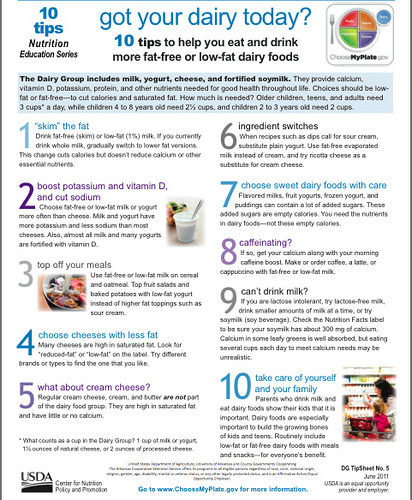 But just as vitamin D is added to dairy products, there are many healthier fortified foods. Our addiction to dairy is a habit perpetrated by big business. Best case scenario: milk is not necessary. Worst case: it’s making us sick. The dairy industry is playing a game with our health when it dismisses dairy free milk as a “whacky alternative”. Only individuals have the power to take back their own health. But it requires conscious change. It requires commitment. It requires a deeper look at the massive amounts of misinformation designed to create a profit. It requires trusting your gut. At first, it’s not easy…creating a new normal never is. Bucking the system and going against culture can be complicated. But when you know better, you have to do better; become the solution instead of perpetuating the problem. Don’t go back to sleep. Wake up! Enjoyed this one very much. I keep thinking about when you quoted Hitler as saying, He who controls the youth, controls the future. Just scary. may sound odd, but I like listening to your podcast while soaking in the tub away from distractions. I find them encouraging and helpful! So thank you! Knowing the podcasts are appreciated makes the effort worthwhile. Thank you very much! What family farm is in a potsiion to purchase quota? Dumb idea. Are we not as usual in a milk deficit potsiion? Better management practices may be appropriate for farmers but first they need to be solvent. A fair share of the milk dollar has to go to them now.